We pride ourselves on our donuts. Some of our specialties include our Homecut, Old Fashioned Sour Cream, Apple Cider, and Honey Dip. We have all kinds of cake and raised donuts, filled and frosted. 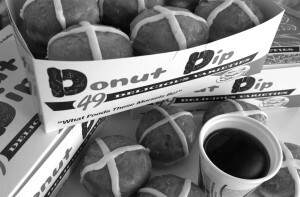 We also have seasonal specials like our Pumpkin Cake (available during fall) and Hot Cross Donut (available during Lent). If there is every something you don’t see in our display, mention it! We would be happy to make you something if possible! Along with our vast selection of donuts we have numerous pastries, muffins, and even cookies. 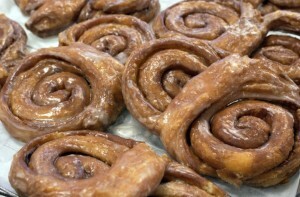 A variety of Danish, Fruit Squares, and Apple Fritters– just to name a few! 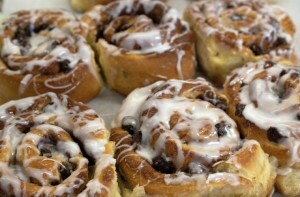 Pastries vary daily, we are happy to take orders! 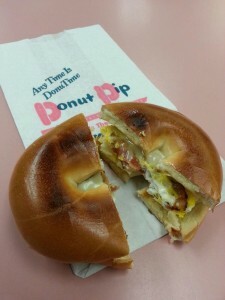 We have DELICIOUS Breakfast Sandwiches that we make fresh to order. Have it on a Bagel, Croissant, or English Muffin. BELLYBUSTERS! Available in two sizes- Regular Bellybuster and X-L Bellybuster. Different varieties available, call to order. We have proudly served New England Coffee for over 40 years. We love it, and we think you will too! Our Breakfast Blend, Dark Roast Blend, French Vanilla, and Hazelnut are available everyday, along with other varying or seasonal flavors such as Cinnamon Sticky Bun, Blueberry Cobbler, Irish Cream, and Pumpkin Spice- just to name a few! Hot or Iced. Try our fresh, home-brewed, unsweetened ICE TEA- now available!